As the weather in Salt Lake City transitions into fall I crave heavier, heated foods. I spend my summer craving lighter raw meals, and as soon as the weather gets the fall crisp in the air, I immediately crave pastas, animal protein, and more cooked foods. Generally when I eat animal protein I try to stick to organic, free range, grass-fed meat and poultry. 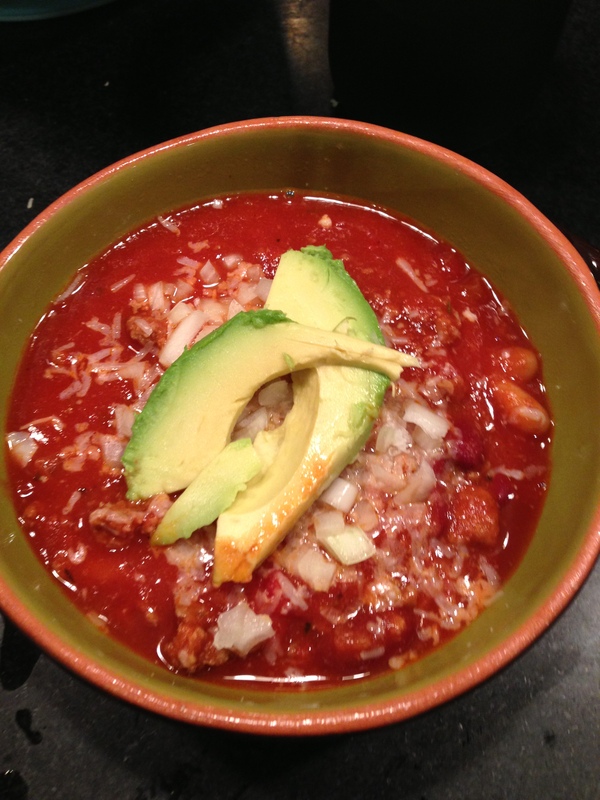 This chili recipe is my mom’s recipe with a few changes. It reminds me of home, my mom always made it during the fall and winter, and it was a family tradition to eat it when we decorated our Christmas tree. 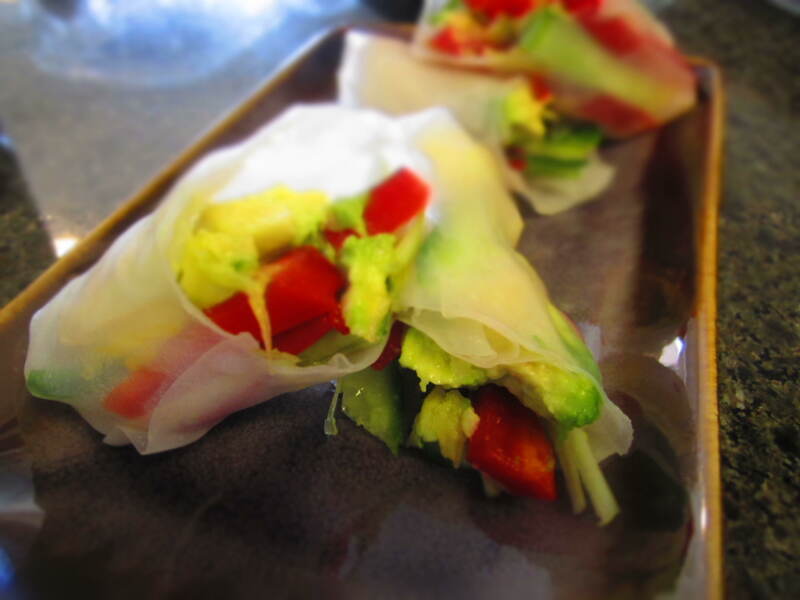 I love it because it is so simple, and delicious filled with protein to keep you full. 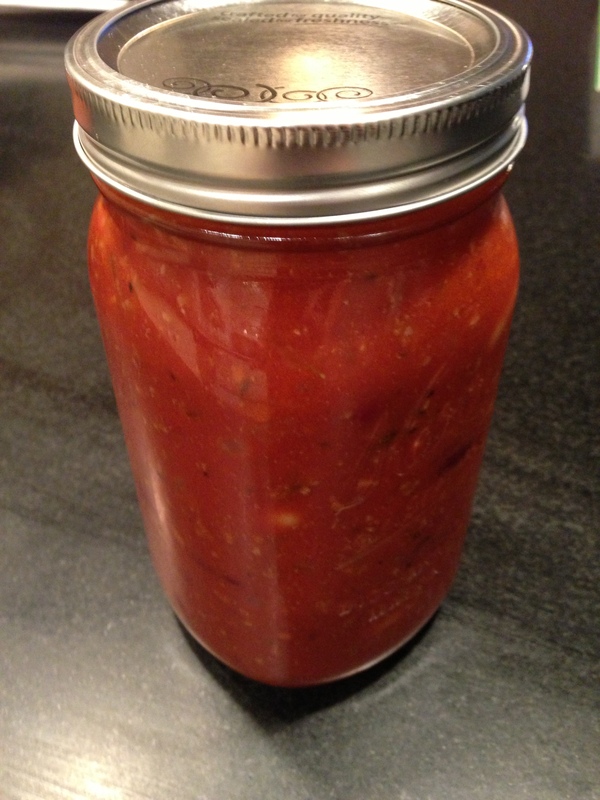 I like to make a big batch and freeze half of it in a mason jar so it is ready to go on nights that we don’t have time to cook. Add butter to a saute pan over medium heat. Once it is melted add chopped onion, and saute for 5 minutes until it starts to become clear and soft. Add chopped garlic and ground meat, about 3/4 tablespoon of salt and pepper. Cook in skillet until beef is cooked through. In the meantime, Heat a large soup pot over medium heat adding, crushed tomatoes, tomato sauce, water, tomato juice, a pinch of salt, crushed red pepper, and savory spices. Bring to a boil. Once the tomato mixture starts to boil reduce heat, and add half of the cooked meat. Stir in tomato paste and chili powder. Season with salt and pepper to taste. Add the remaining beef, kidney beans, cannellini beans, and let simmer over medium-low heat for an hour. I like to top mine with a little raw onion, avocado, and sometimes some raw goat or sheep’s cheese. Enjoy! When JJ Smith said the statement “Eating healthy is the new black” at the September 2012 IIN Live Conference, it triggered many thoughts in my head. I do believe that she is right. But there is also something to be said about the fact that Americans are the unhealthiest in 2012 than any other time in history. JJ also said that people who are interested in health are already healthy. They’ve already adopted the “eating healthy is the new black” motto and are working hard to spread it and inspire people to do the same. I find it fascinating that being healthy is so in. There are yoga studios on every corner where people can go to achieve balance, focus their mind inward, and relieve stress. Health food stores are expanding across the country, and even major chain grocery stores are coming out with their own organic and all natural lines. Restaurants are offering healthier options, and putting right on their menu how many calories each dish has. I even saw a commercial for our beloved pets advertising gluten-free dog food! And at the same time so many Americans and people around the world are not taking care of their bodies. They seem to be in a state of denial about what they are doing to themselves and their families. This is one of the reasons I choose to take this journey and attend Institute for Integrative Nutrition. If you don’t help the problem then you are the problem and I can’t sit around and watch young and old Americans live a lifestyle that is so alarming and destructive. Watching so many inspirational speakers at the IIN conference was motivating and continues to impact thousands of students from IIN around the world. For those of you who are not students at IIN or did not get a chance to experience this amazing conference I wrote down my favorite quotes that stood out the most to me. Bernie Siegel says to put quotes and inspirational photos around your house, “make an altar” he says. I encourage you to make yourself inspiration altars around your house to inspire, encourage and promote positive energy in your home and life. I love inspirational quotes because they reach each person on a different level. A quote can stand out to hundreds of people in one room and spark something different inside each person. I hope at least one of these quotes stand out to you and help motivate you to make positive changes in your life. The time is now. Take action in your own life. Stop putting blame on those around you, and start taking responsibility for you. Start one day at a time, what change can you make today to better your life? Start a gratitude journal, meditate for five minutes, go for a walk outside, or add more veggies on your plate. It is never too late to make positive changes, your body and mind will reward you. I used to by the pre-made spring rolls from Whole Foods all the time. They are not cheap at about $7 a container I figured it was time I experimented with rice paper at home, seeing as this was the only thing holding me back from making them myself. Turns out rice paper isn’t so bad, you soak it in water for about 40 seconds and it becomes soft, then you can roll veggies, fruit, or even fish in it. These will last in the fridge for about 2-3 days, so make some ahead of time and take them to work with you! I like to dip mine in peanut sauce, tamari or in what else, guacamole! 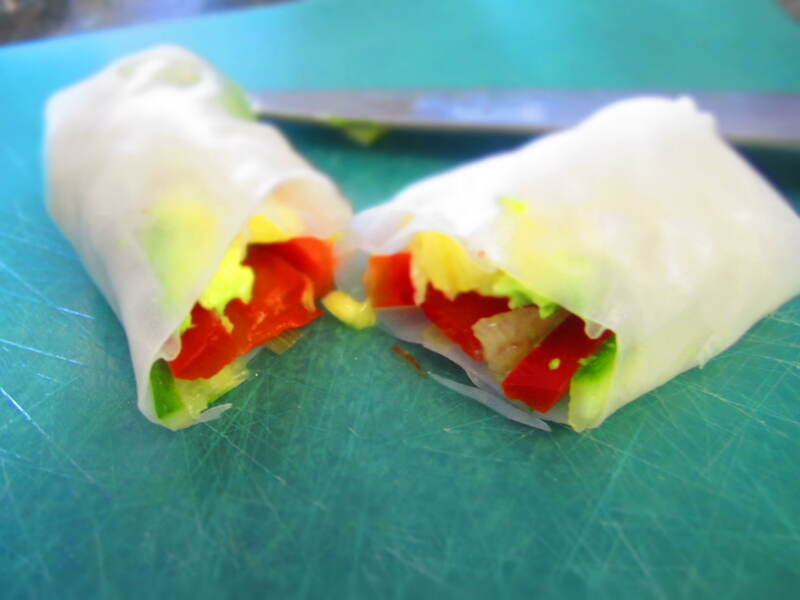 What you decide to put in the rice paper is up to you, use whatever veggies you have on hand, make it tropical by adding some pineapple, or mango, or add extra protein by throwing leftover shrimp or chicken. There is no frying involved so this is a better option than ordering fried spring rolls from a takeout restaurant. 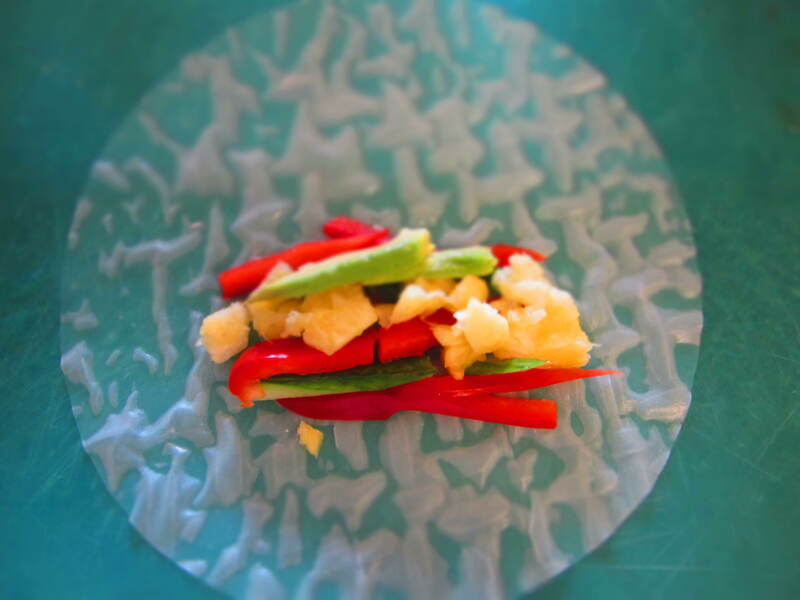 Add one sheet of rice paper to large bowl with water. Let it soak for about 40-60 seconds until it becomes somewhat soft, but not too soggy. Place about 2-3 strips of romaine lettuce(optional towards the bottom of rice paper. The Lettuce helps to keep everything else in place, I did not use lettuce in my rolls simply because I didn’t have it. If you not using lettuce, skip this step. Add additional fillings(about a small palm size full), bell pepper, cucumber, guacamole-whatever you’re using-on top of lettuce. Wrap up like burrito! 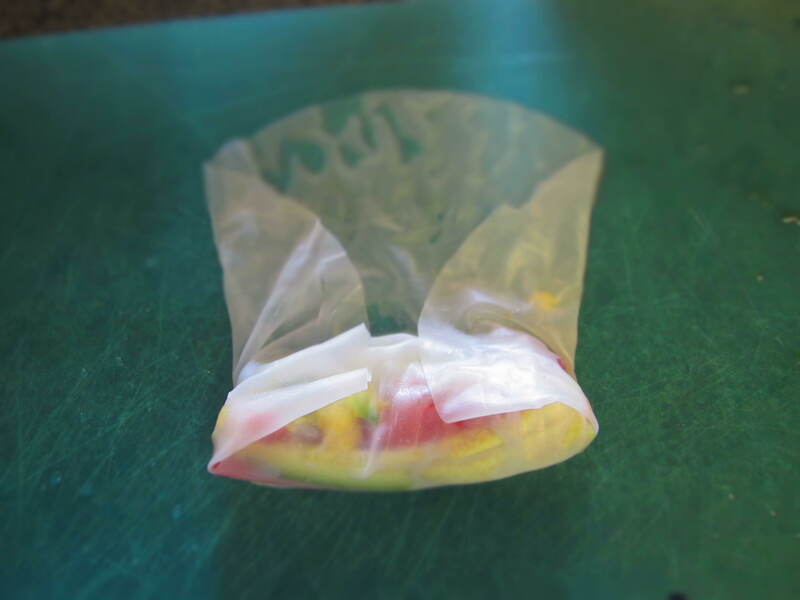 Roll the wrap once, to cover the filling, then fold the sides in and continue to wrap. This may take a few times to get it right, don’t worry if it doesn’t look perfect because it will taste good regardless of its appearance. Repeat steps 1-5 until you’ve used all your filling. Dip in your choice of sauce and enjoy. 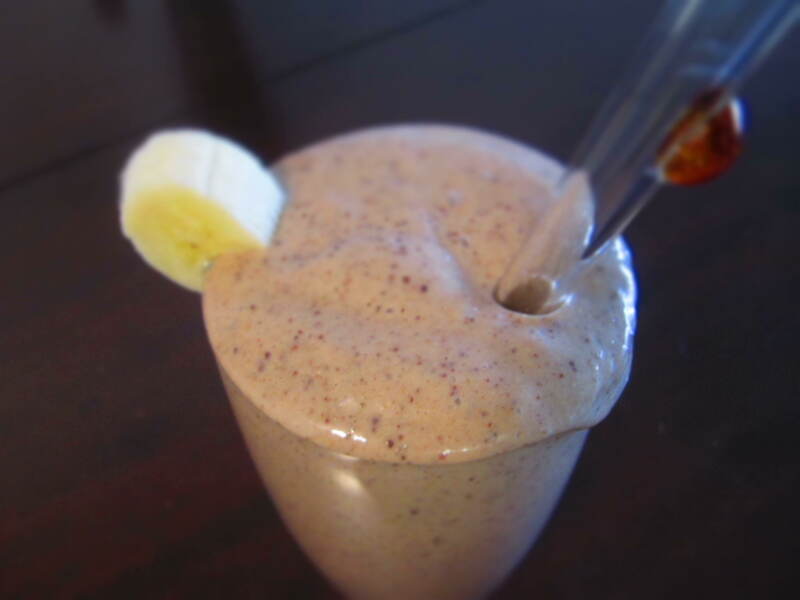 Smooth and creamy this smoothie will satisfy your banana split cravings and give you an energy boast. Quick tip: Buy bananas at the grocery store in bulk when they are on sale, when you get home peel them, place 1-2 in a zip lock bag than place in the freezer. This way you’ll always have frozen bananas ready to be the base of any smoothie! Preparation: Blend all ingredients a blender, adding almond milk till desired thickness. *If you buy products at iHerb.com use the coupon code OZI624 to get $5 off your first order, and free shipping on $20 or more!!! 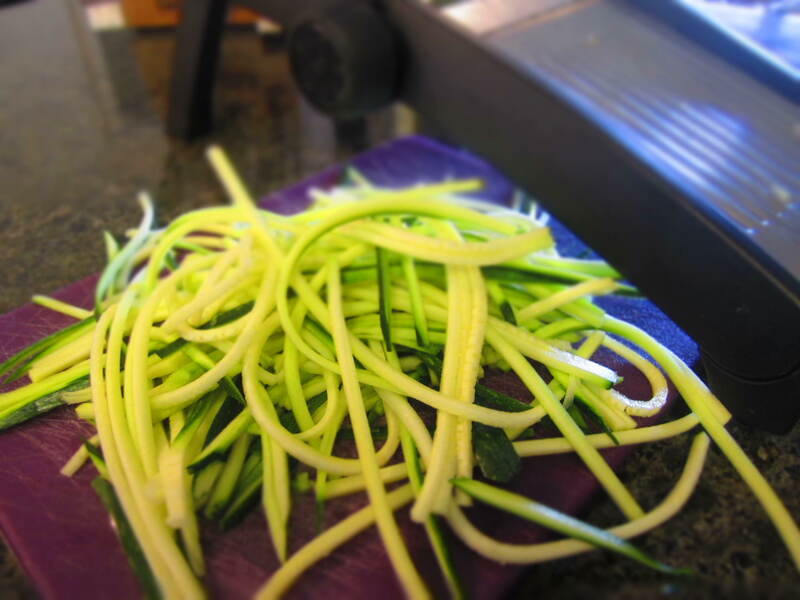 Shred zucchini with a mandoline slicer or you can use a spiral vegetable slicer. 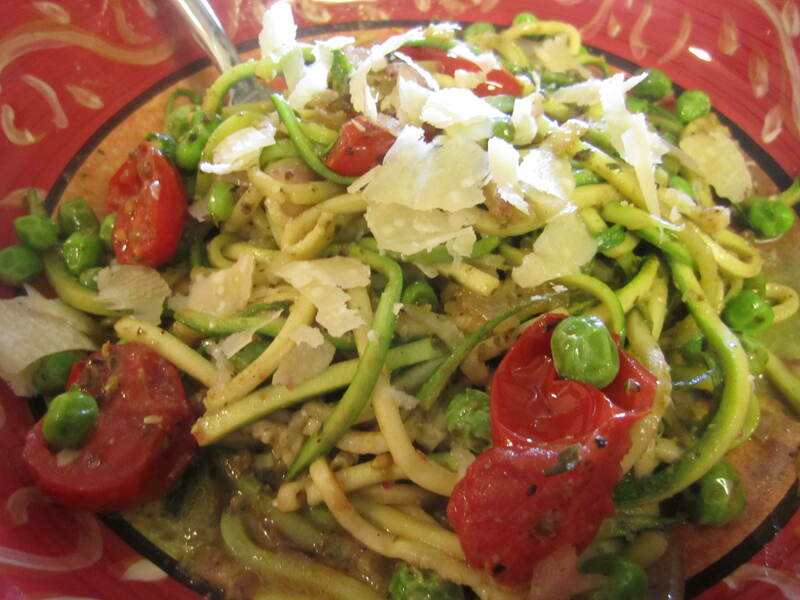 Either way you’ll want zucchini to look like thin spaghetti noodles. Set zucchini aside. Place a medium sized pan over medium head add butter, coconut oil and onion. Saute until onions are translucent about 5 minutes. Add green beans and peas cook until green beans become somewhat tender but not mushy(unless desired) 5-7 minutes. Flavor with salt and pepper. Add minced garlic, cherry tomatoes and pesto. Mix veggies so pesto evenly coats green beans and peas, turn head down to low-medium. Add zucchini to pan. Mix evenly so pesto sauce covers all the zucchini. Add a splash of water if sauce is too thick. Season with salt and pepper to taste. Sprinkle with a little fresh Parmesan and you are ready to eat!